While I wholeheartedly approve of these efforts, I have never been fond of the solutions made publicly available. The current state of the art — admittedly forced upon developers by the limitations of CSS — seems to rely on drawing linear gradients and multiple shadows (I have seen up to 12!). These solutions have the undeniable quality of working but the idea of drawing so many shadows, even without blurring them, makes the graphics programmer in me cringe. They also only work on solid color backgrounds. I do have two solutions to offer and that I have made available on GitHub. One solution works on API level 19 and up and the other one works on API level 1 and up. Or at least it should work on API level 1 and up, I have not exactly tried. I trust the documentation. API level 19 (better known as KitKat) introduced a fantastic new API for paths manipulation call path ops. This API allows you for instance to build the intersection of two paths or to subtract one path from another. Note that the resulting path can be used to render the original text using a fill style. We are instead going to use it for further operations. The stroke width determines how much space you want to leave between a descender and the underline. Regions are an efficient way to represent non-rectangular areas of the screen. 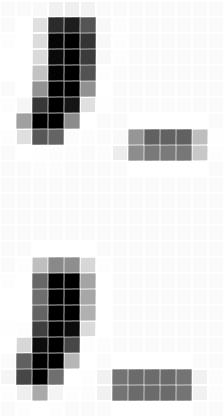 You can imagine a region as a collection of rectangles aligned with the pixel boundaries of the render buffer. Regions can be used as a rasterized representation of a path. This means that if we transform a path into a region, we obtain the collection of pixels coordinates that would be affected by the path if it was drawn. What makes regions particularly interesting, is that they offer operations similar to path operations. Two regions can be intersected, subtracted, etc. More importantly, regions have been part of the Android API since the very first version. The region implementation is almost identical to the path implementation. The major difference lies in when and how the outline path is clipped. Due to the nature of paths and regions, there is a subtle difference between the two implementations. Because path operations work only on curves, they preserve the slant of the descenders when we subtract them from the underline. This creates gaps that run parallel to the curve slopes. This may or may not be the desired effect. Top: paths. Bottom: regions. Notice the slant? If not, you should. Look harder. Should I use this in production? Before you try to use these techniques in your application, be aware that I have not done any performance measures at this time. Please remember that this exercise was mostly a fun programming challenge. The code provided does not try to position the underline text decoration properly depending on the font size. It also does not vary the width of the gaps based on the font size. 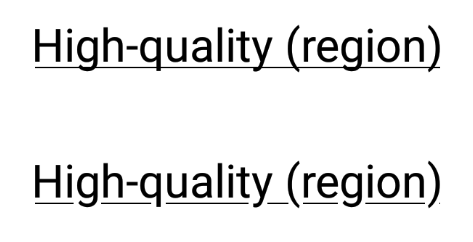 There might also be issues that are font dependent as I have only tried the effect with some of Android’s default typefaces. Let’s call these issues exercises left to the readers. If you were to try and use this code in your application, and I must admit I’d love to see an implementation for spans, I would encourage you to at least cache the final fill path. Since they depend only on the typeface, font size and string, a cache should be fairly trivial to implement. In addition, the two implementations described in this article are understandably restricted by the public SDK APIs. I have a few ideas on how this effect could be achieved more efficiently if it were to be implemented directly into the Android framework. The region variant could for instance be optimized by rendering the region itself, without going back to a path (which can cause software rasterization and GPU texture updates). Regions are internally represented as collections of rectangles and it would be trivial for the rendering pipeline to draw a series of lines or rectangles instead of rasterizing a path. Do you want to know more about text on Android? 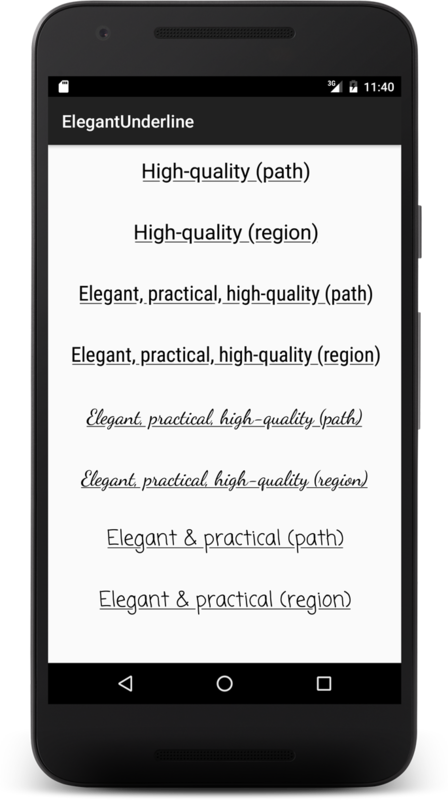 Learn how Android’s hardware accelerated font renderer works. Get the source of the demo on GitHub.